Made in Melbourne, Victoria, Australia, 1885. 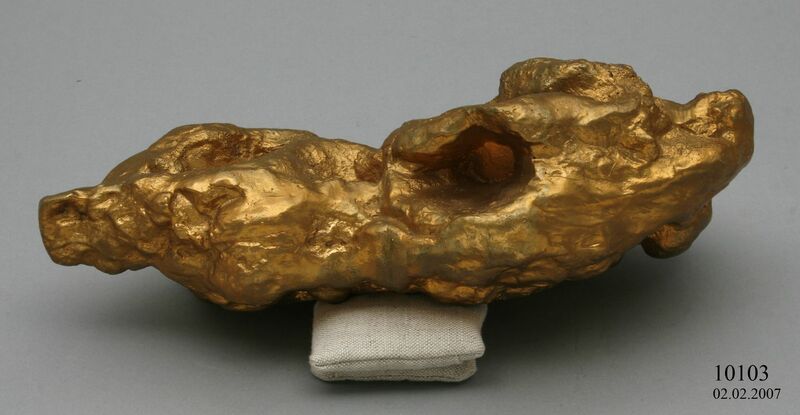 A plaster of paris model of a large gold nugget 'No.144'. Painted in gold with a nobbly surface. The 'Precious' nugget was originally obtained at Catto's Paddock, Berlin (now Rheola), Victoria. Depth from the surface, 12 feet. Gross weight, 1717 03. Approx. value, 6868 sterling pounds. Found in January 5th 1871. The original nugget was found at Berlin (now Rheola) west of Bendigo in Victoria.